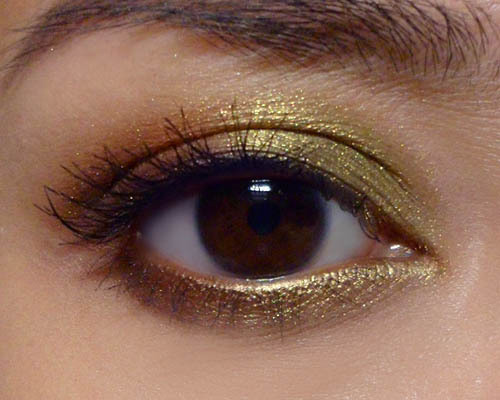 I'm featuring a slightly less dramatic and more wearable green in this look. 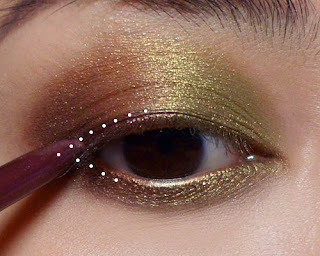 Instead of blue-based greens, gold-toned greens and limes tend to be more subtle, so look out for shades with a bit of yellow, like NYX's roll on eye shimmer in Olive. I used I Nuovi's Moss, which might be a bit harder to locate for most of you outside of Asia. 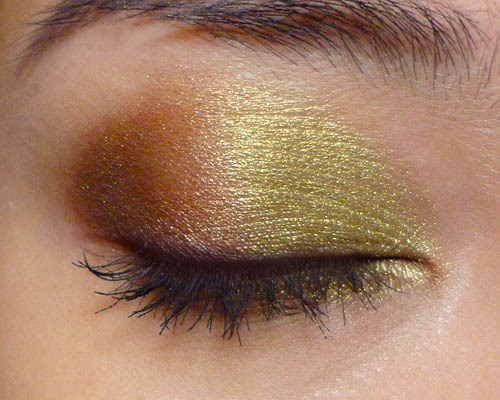 You'll also need a very warm amber-gold (almost like a light golden bronze; try NYX Golden shadow) and a richer chocolate brown like NYX's Walnut. Step 1: First, pack the golden green to the inner 2/3 of the lids. Step 2: Just outside of the center, apply the amber gold, blending lightly into the green so there are no harsh lines. This is going to be the "Transition" shade between the green and the brown. Step 3: Finish with a richer brown right in the outer corners. The green should take up the majority of the lid, with the amber and brown sharing the outer half. Step 4: Finish by using a plum or dark brown pencil to line the outer half of the lash lines just for extra definition. I used Rimmel Exaggerate Eye Definer in 220 Perfect Plum. Step 5: Finish the look with black mascara and that's it! Just linked your tutorial to my post. I hope it is ok with you. Hi dear, I found you thanks to Patricia! Lovely look, the colours are simply stunning!